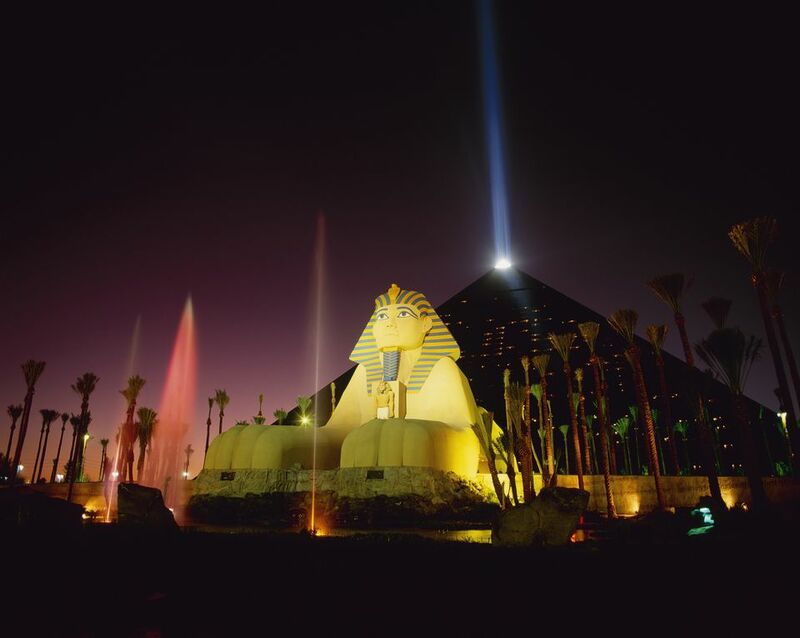 Budget travelers heading to Las Vegas can expect a good deal and affordable options on food, entertainment, and attractions at Luxor Las Vegas Resort and Hotel. Located on the south end of the Las Vegas Strip, this resort sits between an upper-end hotel in Mandalay Bay and a budget-friendly resort, Excalibur Las Vegas. Its proximity to these nearby resorts as well as the intersection of Tropicana and Las Vegas Boulevards make it ideal for a budget traveler who can afford slightly more than the cheapest accommodations but still wants to experience all that Las Vegas has to offer. An indoor walkway connects Luxor to Mandalay Place on one side and Excalibur Hotel and Casino on the other. Between these three connected establishments, there are plenty of food and entertainment options including Hussong's Cantina, Slice of Vegas, and Burger Bar—all of which offer affordable and convenient meals in casual dining environments. Blue Man Group: If you love to move your feet and clap your hands, this is one of those shows that is sure to please. Loud music, imaginative performance, and a sensory display of lights and movements make this a great act for all audiences. Criss Angel Mindfreak Live! : One of the most famous magicians in America partners up with one of the most famous circus acts on the planet, Cirque Du Soleil, to put on this illusion-filled show multiple nights a week. Fantasy: A seductive show that's been on the Strip for 18 years, led by beautiful performers who role-play a few of your favorite fantasies. Entertainment in the form of dance and sound, this show works for couples and is sultry enough for the adventurous but not so much that it crosses the line into sleazy. Carrot Top: Yes, he is still at it, and in Las Vegas, he still makes people laugh with his props and his sense of style. You have to see this show once to realize that he is more than just a guy who pulls stuff out of a box. He's hilarious. Bodies...the Exhibition: Located in the atrium level of the Luxor Resort, this attraction allows visitors to get an up-close look at the anatomy and inner-workings of the human body through interactive displays and real-life exhibits. Yes, these are real bodies on display so consider that before you enter. Titanic: The Artifact Exhibition: A walk through this exhibit helps you understand why the Titanic has long been repeated. Opulence and legend are combined to reveal a fascinating narrative about a disastrous cruise, and the artifacts reveal tiny bits of history and individual stories that give you a sense of time and place for this tragedy. In addition to the live shows, you can also enjoy a whole host of amenities when you stay at Luxor Resort including access to the large outdoor pool and poolside cabanas, a spa, a salon, a shopping center, and an immersive outdoor dining and entertainment destination known as The Park as well as the signature Luxor Casino. Rooms at Luxor start at $51 per night for Pyramid Queen rooms and range in price up to $81 for Pyramid Corner King Suites, both of which are older accommodations that are a little dated for the 2010s. However, Luxor also finished construction on a new tower of hotel rooms in 2017, which cost about $58 per night. The unique draw of staying in rooms inside the Pyramid is that the outward-facing wall and windows slant down because they make up the outside facade of the building, but this also makes the rooms feel slightly smaller than other accommodations on the Strip. Fortunately, the rooms in the Tower are plenty big and the windows aren't slanted at all. You can still see shows and exhibitions at the Luxor even if you don't stay there as a guest, and since Las Vegas has plenty of places to stay, you shouldn't feel obligated to stay at the Luxor just because you've booked tickets for a concert there. From luxury resorts to family-friendly and casino-free hotels, where you should stay on your trip to Las Vegas really depends on who you're traveling with, how much you have to spend, and what you want to be closest to on the Strip.